Stop the abuse and torture of prisoners! Pack the court on Feb 17! 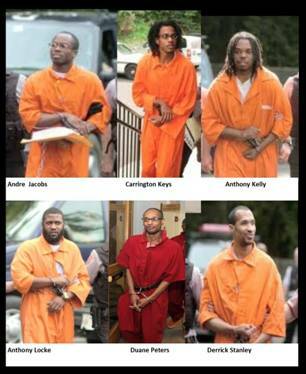 Their jury trial will begin on February 17, 2015 in Wilkes-Barre, Pennsylvania. Why support the Dallas 6? 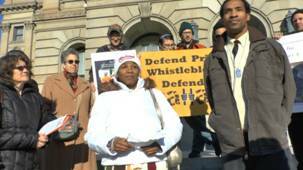 They are whistleblowers who put their lives on the line by taking action to stop the rampant abuse and violence by guards at SCI Dallas and other PA prisons. We all depend on prisoners like the Dallas 6 to tell the truth about our society and to defend all our civil and human rights. They are part of a movement of prisoners taking action and speaking out through hunger and work strikes such as in Georgia, Ohio, Alabama, Illinois, Indiana, Virginia and California. Torture must remain illegal in this country. Charles Graner honed his torture skills in PA where he was a prison guard before moving on to Abu Ghraib. We should not have to go to Iraq to find out what is happening here, not when there are prisoners telling it like it is. Solitary confinement is torture according to Juan Méndez, UN Special Rappateur on Torture, who has called for an absolute ban on solitary for longer than 15 days. Mass incarceration has meant many prisoners are inside for non-violent offenses such as minor drug convictions, immigration and parole violations & not paying fines, or are innocent of any offense. But whatever the offense, the sentence does not include torture. Their trial is taking place in the infamous Luzerne ‘Kids for Cash’ County where judges were convicted of kickbacks for incarcerating children. Legal help is needed to navigate those dirty waters. ► Fundraisers in Pittsburgh Feb 13 and Philadelphia Feb 14. ► Endorse the call to support the Dallas 6. ► Help to pack the court on Feb 17. Sign up here if you are planning to come, need or can offer transportation/ housing. ► Set up a speaking engagement for Shandre, Derrick and Isaac who give dynamic presentations (see video below). ► Sign the Petition to Indict Corrupt Luzerne County Officials. ► Help with housing, rides, food for those coming to the trial. Your support is needed to insure that these men receive a fair trial, that the abuses that they faced in prison do not continue, and, for the legal precedent that this court case will establish. If the Dallas 6 are justifiably cleared of all charges Pennsylvania prisoners will be able to speak up against abuse and torture without fear of retaliation. Justice for the Dallas 6 Support Campaign: Abolitionist Law Center; Every Mother is a Working Mother Network; Fight for Lifers West; Germantown Friends Meeting Mass Incarceration Working Group; Global Women’s Strike & Women of Color@GWS – US; Human Rights Coalition – Fed Up; Human Rights Coalition – Philadelphia; Marcellus Shale Earth First; Mishkan Shalom New Jim Crow Study-Action Group; Payday men’s network; Peacehome Campaigns; Shalefield Organizing Committee. Endorsements: Brandywine Peace Community; California Families Against Solitary Confinement (CFASC); The Center for Returning Citizens (TCRC); Decarcerate PA; Defending Dissent Foundation; Global Women’s Strike & Women of Color@GWS – UK; Human Rights Defense Center – Lake Worth, Florida; Jewish Voice For Peace - Philadelphia; Sin Barras – Without (Prison) Bars – Santa Cruz; T'ruah: The Rabbinic Call for Human Rights; WHAT’S UP?! Pittsburgh; Welfare Warriors; Women’s International League for Peace and Freedom (WILPF) – Philadelphia. Individual Endorsements: Pam Africa, International Concerned Family and Friends of Mumia Abu-Jamal; Patrice Armstead, Building People’s Power and Coalition Demanding Reinstatement of Dr. Monteiro; Malik Aziz, Founder, Men United for a Better Philadelphia and Chairman, National Exhoodus Council; Pastor Antoinette Johnson, King Solomon Baptist Church; Dr. Anthony Monteiro; Rev. Bob Moore, Executive Director, Coalition for Peace Action (for id purposes only); Dr. Heather Ann Thompson, Professor of African American Studies & History, Temple University; Dr. Cornel West, Princeton University; Dr. Carla Willard, Africana Studies Program, Franklin & Marshall College. Partnering with: AFSC Prison Watch. Six African-American prisoners from the State Correctional Institute (SCI) in Dallas, PA are facing charges of “rioting” for blowing the whistle on the abuse of prisoners in solitary confinement. On April 10, 2010, illegal and barbaric conditions at the hands of prison guards at SCI Dallas led these inmates, held in solitary confinement, to stage a protest. For over a year they had suffered food deprivation, destruction of mail, beatings, neglect of medical conditions, use of a torture chair and the deaths of some other prisoners, including the coerced suicide of an older white prisoner with mental health issues. After guards kept prisoner Isaac Sanchez confined in a torture chair overnight, six protested by covering their cell door windows with their bedding. The prisoners demanded that the abuse stop, and requested access to their counselors, state police, the District Attorney and the Public Defenders’ Office. They had no access to telephones or computers and their incoming and out-going mail were being destroyed to undermine their ability to expose the corruption. Prison guards responded with an armed assault against the unarmed men locked inside individual cells. They attacked the six men with electroshock shields, tasers, fists and pepper spray. The guards involved suffered no injuries and initially no charges were filed against the Dallas 6, who were left bloodied, naked, burnt and in pain. Although some of the men were transferred to other prisons, they were able to file complaints and initiate civil actions against the prison guards and officials involved. Prison officials, state police and the Luzerne County DA retaliated four months later by charging the Dallas 6 with rioting. The Dallas 6 believe that they are facing these trumped up charges because they contributed to Institutionalized Cruelty, Human Rights Coalition Report 1, and, then subsequently stood up for their lives, which is documented in Resistance & Retaliation, Report 2. The US has the largest prison population in the world with Black and Brown communities disproportionately impacted. Prisoners across the US are taking action and speaking out against their inhumane and tortuous conditions, including prisoner hunger and work strikes in Georgia, Ohio, Alabama, Illinois, Indiana, Virginia and California. As a result of their actions, prisoners are retaliated against by prison authorities. The trial of the Dallas 6 will represent a moment of truth and exposure about wide-spread use of solitary confinement and torture in prisons. We call on all who believe in justice and equality to support the Dallas 6.